Named for the shape of its northwestern face, Heart Mountain is an very popular scramble in the front ranges of Kananaskis Country near Canmore. One of the easiest scrambles in the Kane guide, and a great place to introduce newcomers to the activity, the mountain and its loop circuit traversing Grant MacEwan Peak offers great views of the prairies, numerous lakes and the Bow Valley. A side-trip to the locally named "Twin Towers" to the southeast adds considerably more challenge to the day and rewards with improved views into the Kananaskis River Valley. I made this trip a month before the devastating flood events of June 2013, which saw the Heart Creek area receive close to 270mm (27cm or 10.5") of precipitation in less than 30 hours. The force of these waters was so severe that the creek bed in Heart Canyon (between Heart and MacGillivray mountains) was dredged by over 2m (7ft. ), erasing the trail beside it in the process. Given this event, it's possible that some of the details in my route description and the features shown in my photos may have changed. The Heart Creek Day Use Area can be found immediately south of the Lac Des Arcs interchange on the Trans-Canada Highway (Hwy 1). The Day Use Area has a large parking area and washrooms, and you'll find the trailhead just to the left of those washrooms. An easy forest walk of less than a kilometre will lead you from the trailhead to the crossing of Heart Creek. At the time of my trip there was a nice wooden bridge traversing this creek, but the chances of it being there now, or even being rebuilt in the short term, is about zero. However, the creek crossing should be fairly easy to accomplish via rock-hopping. On the other side of the creek you'll be met with a four-way junction with the first trail to the right (with a camping warning) leading to the now obliterated canyon trail, the second to the right (with a scramble terrain warning) leading to Heart Mountain, the third (straight ahead) is the return trail from the loop circuit, and the fourth leading directly to the highway on the left. You'll want to take the trail to Heart Mountain. The trail from the highway next to Heart Creek offers a potential shortcut for anyone looking to cut 1.6km of easy hiking from their day. There's little mystery to an ascent of Heart Mountain, just follow the trail up the west ridge, but there is a choice of numerous lines as the ridge opens up in sections higher up the mountain. While these options can vary between easy hands-on scrambling, or trickier slabs, it's easy enough to find a line which can simply hike up for the entire ascent except for the “crux”; which is a hands-on climb of a short cliff band that happens to be hilariously marked with a bolted sign featuring a red up arrow. The rock at the crux is surprisingly smooth, but offers very secure holds and shouldn't be difficult for anyone with the motor skills to reach this point. From there it's smooth sailing to the “summit”. 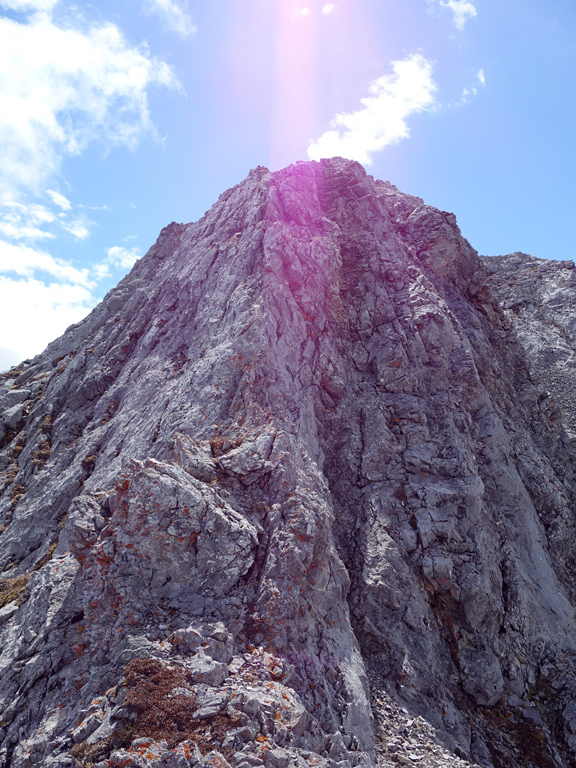 I place summit in quotes because you'll very quickly realize that Heart Mountain is just a small highpoint on the northwest ridge of Grant MacEwan Peak, which rises gently to the southeast. Heading for the summit of Grant MacEwan Peak is highly recommended as it's an easy and quick ridgewalk, taking roughly 30 minutes. From there you'll get your first views of Barrier Lake and Mt. Baldy, and a good look at the rest of the alpine circuit along MacEwan's eastern ridge. The descent from the summit of Grant MacEwan's Peak along its eastern ridge begins with an easy eastward ridgewalk with great views towards Barrier Lake and the prairies before turning north and beginning a long, and very gradual descent, back towards the Bow Valley along an obvious trail. Follow the trail west ward once you reach the bottom, eventually around a large pond, back to the 4-way junction at Heart Creek, and then back to the trailhead. Taking a side trip from Grant MacEwan Peak to the “Twin Towers” is recommended for more experienced scramblers, and can vary between moderately difficult and difficult depending on your route selection. While the southern ridge connecting Grant MacEwan to the towers looks pretty straightforward from MacEwan's summit, the view conceals a difficult downclimb at about the halfway point. A bypass around the crux downclimb does exist, and I highly recommend it. As suggested by my friend Marko, the bypass route starts directly from the summit of Grant MacEwan by descending the grassy slopes to the skier's left of the ridge and contouring around the cliffs before an easy, but very loose scree slope (beware of rockfall here if in a group) brings you back to the ridge, immediately beyond the crux. The route from there to the base of the summit of the West Tower follows a narrow ridge that can become significantly exposed at points, but not technically difficult. The last push to the summit of the Western Tower involves some very steep, exposed terrain. If you look at this photo, there are three route options: a loose scree ramp that you can descend to on the climber's right, and easier rock route to the climber's left, or you could do what I did, and head directly up. The direct route had a bit of a gap between good holds, but I managed to get through it, and was soon on the summit looking at Kananaskis peaks such as Mt. Baldy, Mary Barclay's Mountain, and The Wedge to the south. To reach the higher East Tower, descend the loose scree slopes on the southeast face of the West Tower and then follow the easy ridgewalk across. After a break on the East Tower, I retraced my steps to the West Tower, descended the scree slope (regain the ridge at about the half way point!) and made my way back to the crux on my way back to MacEwan. In order to save time and some unpleasant side-hilling I chose to climb up the crux wall on the return. There are two possible routes for this climb, a direct route to the climber's right that looked potentially fun, but quite exposed, and the normal route. The normal route begins from the climber's left (west) end of the cliff, gains a shallow shelf that is somewhat overhanging and awkward to reach, and then you need to sort of shuffle across the shelf (which is downsloping, exposed, and has overhanging rock which prevents you from standing) before reaching easier scrambling terrain towards the climber's right side of the cliff. The photos in the gallery should help give a better sense of what I've described, but even then, it's one of those routes where you'll wonder how it was ever found. Once you're past it and have gained the ridge top, it's an easy walk back to Grant MacEwan Peak. The ascent of Heart Mountain is also described in Alan Kane's Scrambles in the Canadian Rockies (pg.66). So Nakagawa's trip report was also quite helpful for planning my route to the Twin Towers. 2,135 m / 7,005 ft.
1,297 m / 4,255 ft.
838 m / 2,749 ft.
78 m / 256 ft.
2,197 m / 7,208 ft.
900 m / 2,953 ft.
99 m / 325 ft.
2,319 m / 7,608 ft.
1,022 m / 3,353 ft.
239 m / 784 ft.